Billequin (A. 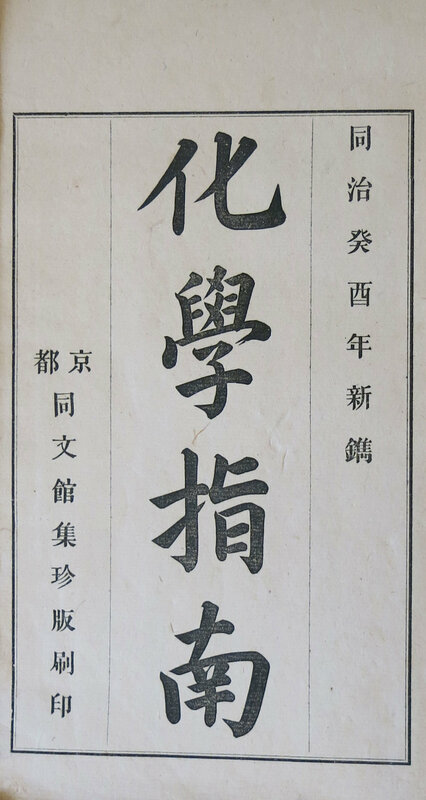 ), 法国畢 利幹[ Faguo Biligan]， 化學指南Huaxue zhinan [Guide to Chemistry]. Beijing Tongwenguan北京同文馆, Tongzhi同治癸酉(1873). 10 册. A. Billequin (1837–1894), who taught chemistry at the Tongwenguan, translated the popular textbook by Faustino Malaguti into Chinese. He was the only member of his generation in China who had been formally trained in this discipline. During his stay in China he performed a variety of chemical research, wrote on traditional Chinese chemical arts and translated a second text (Huaxue chanyuan Explanation of the principles of chemistry, a study of chemical analysis) that appeared in 1882, translated from Karl Fresenius's Chemical analysis.